The NEW CARISSA was constructed with a configuration typical of most bulk carriers: single screw, an aft deckhouse, 6 cargo holds, and a double bottom below the cargo holds consisting of ballast and fuel tanks. Fuel tanks were located on the centerline in the double bottom below holds 2 through 6, with wing ballast tanks located outboard of these fuel tanks. There were no upper wing ballast tanks that are often found in bulk carriers; however, the #4 cargo hold was smaller than the other 5 holds, and was designed for sea water ballasting. Catastrophic failure of the hull girder in two-mode global cyclic bending resulting from wave forces and sea floor scouring, and impact loading from bottom pounding while stranded on an exposed coast, probably exacerbated or hastened by exposure to extreme heat and rapid quenching during attempts to burn fuel bunkers. No extensive forensic study has been completed or will likely ever be completed to analyze in detail the structural failure of the NEW CARISSA. Since the stranding and break-up of the vessel were the result of exceptional circumstances far removed from normal design and operating conditions, it is not likely that there will be lessons learned that can be applied to future vessel structural design. However, a review of the surrounding circumstances, probable causes, and nature of the structural failure of the NEW CARISSA can provide insight to engineers and incident responders that may prove valuable in the future response efforts. 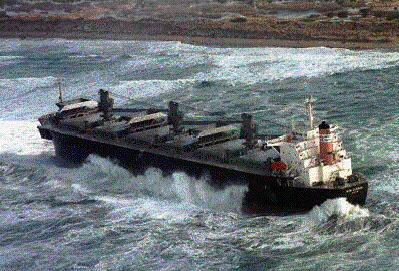 On February 3, 1999, the NEW CARISSA was inbound from Japan to pick up a load of wood chips at Coos Bay, Oregon. Due to high winds and heavy seas from a winter storm, the Coos Bay pilot decided that the vessel should stand off until February 4 before attempting to enter Coos Bay. On the morning of February 4, the NEW CARISSA dragged anchor and grounded approximately 300 yards off a stretch of remote, undeveloped sandy beach 3 miles north of Coos Bay, Oregon (see Figure 1). Within a few hours, the vessel was fully broached (broadside) to the incoming seas. There were approximately 400,000 gallons of fuel on board the vessel at the time of grounding, of which 350,000 gallons was Bunker C and 50,000 gallons was diesel. ere lively; rolling and yawing motions were up to approximately 20 degrees. On February 8, the vessel began to leak oil. A salvage assessment team onboard the vessel discovered that fuel tanks (Bunker C and diesel) and ballast tanks below cargo holds 5 and 6 were breached to the sea. During the period of February 8-10, the winds calmed significantly, but sea swells of 15 to 20 feet continued to impact the NEW CARISSA. On February 10, the engine room flooded due to a major breach that was later determined to be from a fracture located on the lower portion of the forward engine room bulkhead (between the engine room and double bottom tanks under Hold 6). On February 10, a 15 to 20 foot vertical fracture also appeared on the starboard side shell plating, at the forward end of cargo hold 6. On February 10, an attempt was made to burn the oil remaining on the vessel by using incendiary devices to burn holes through the deck of the cargo holds and ignite the oil in tanks below. This attempt failed because the incendiary devices failed to penetrate the thick steel at the bottom of the cargo holds. On February 11, a second burning attempt was made using linear shaped charges to penetrate the decks of cargo holds 2, 3, 5 and 6. Approximately 600 gallons of jellied petroleum was also used as a burning accelerant to ignite the oil. This burning attempt resulted in a spectacular explosion and fire. Approximately 3 hours after the initial explosions, while the vessel burned, the vessel broke in half just forward of the bulkhead separating cargo holds 5 and 6. After the vessel broke in two and the fires burned out, responders resumed salvage efforts on the bow section, which was ultimately towed out to sea and sunk in deep water (see Reference ) for details of this operation). Once the bow section was removed, efforts were initiated to remove all remaining oil from the stern section and dispose of the wreck. The structural failure of the NEW CARISSA was likely the result of a combination of sea floor scouring effects, bottom pounding, and transverse bending from waves. The eventual break-up of the vessel into two pieces can be viewed as a direct result of a combination of these effects. Vessels that strand broadside to incoming seas and surf on a sandy bottom are subject to significant scouring of the sea floor, which can quickly lead to excessive hull stresses. As the incoming waves strike the vessel's side, they are deflected fore and aft until they are able to sweep around the ends of the vessel at high velocity. The high velocity water flow at the ends scours away the sand beneath the bow and stern, and can deposit the sand on the seaward and leeward sides of the vessel near amidships. This scouring and depositing can quickly develop significant hogging stresses on the vessel as a pinnacle is effectively created under the vessel near amidships. (In a hogging condition, the deck of the vessel is placed in tension, and the bottom structure in compression.) The scouring can also place excessive localized compression forces on the bottom structure as the weight of the vessel is transferred to the sand pinnacle, resulting in crushing of the bottom structure. Thus, it is good practice to try to prevent a stranded vessel from broaching by whatever means possible, including ground tackle, tug assistance, and ballasting. If the ship has broached in such conditions, an extraordinary effort should be made to turn the vessel end on into the seas (Milwee 1995). Vessels that strand in heavy seas will likely suffer structural damage due to pounding impact between the sea floor and the vessel bottom. When a vessel initially grounds in large seas, the ground reaction will not normally be high enough to prevent the vessel from lifting off the bottom as large swells pass. As a result, the vessel will drop back on the sea floor with significant impact as each wave crest passes. This impact can quickly lead to structural damage at the point of ground contact. One simple method to eliminate liveliness and bottom impact is to ballast a stranded vessel down as hard as possible. This can increase the bottom contact, spread the load, and reduce localized bottom stresses (Milwee 1995). The damage incurred on the bottom of the vessel that resulted in breaching of the fuel tanks and engine room was most likely due to excessive localized compression from scouring and progressive damage from pounding. The vertical fracture on the side shell of the vessel was reported by on-scene personnel to be associated with a vertical buckle that was seen to be working in and out in response to wave impact. This buckling was most probably the result of compressive hogging stresses (from bottom scouring) in combination with transverse bending stresses created by large waves striking the port side of the vessel and flexing it laterally about the stranding pinnacle. The transverse bending due to wave action would act to cyclically superimpose tensile stresses on the port side, and compressive stresses on the starboard side with each wave impact. An important consideration when reviewing this failure is that the NEW CARISSA was constructed of high strength steel (exact ultimate strength unknown). It is generally understood and accepted by designers and engineers that high strength carbon steel structures have less fatigue resistance (strength under cyclic loading) than similar structures constructed of mild steel. There have been many examples in the marine industry of premature fatigue failures of high strength steel structures. This characteristic of high strength steel was likely a contributing factor to the rapid rate of crack growth on the stranded NEW CARISSA as it was exposed to excessive cyclic loading from the heavy seas and surf. It is also an accepted principle of materials engineering that high strength carbon steels are very sensitive to high temperatures while in service. Sustained elevated temperatures can quickly anneal the steel by removing strengthening precipitates from the matrix of the material, resulting in the loss of high strength properties. Additionally, rapid cooling (quenching) of hot steel is known to cause embrittlement, which further degrades the fracture resistance of the structure. The burn subjected the vessel to both effects; the extremely high and sustained temperatures had an annealing effect, and areas of the structure subject to wave contact were repeatedly subjected to heating and quenching. Figure 2 depicts the heat-affected areas of the vessel where the coatings were burned away leaving bare steel and rust. It shows severe heat warping and coating damage in the failure region and clearly indicates that the highest temperatures occurred in that location. The stranding and structural failure of the NEW CARISSA highlights the impressive forces that can quickly be imposed on a vessel broached in heavy surf on a sandy beach. The forces on such a vessel have been discussed as being a combination of 2 mode global bending of the hull girder (hogging and transverse bending), localized vertical compression from the formation of a pinnacle below the vessel, and impact forces from bottom pounding. These bending and impact loads all stem directly from or are amplified by the effects of bottom scouring. When considering the likely response of the NEW CARISSA's hull steel to high temperatures, and reviewing the pictorial evidence of the heat damage, it can be concluded that the burn attempt significantly hastened the break up of the vessel. The fact that there was limited visible damage to the hull structure before the burn (just 3 hours before catastrophic failure of the structure) also supports this conclusion. The multi-member structure of a large modern ship is complex and redundant and will normally suffer extensive visible progressive damage before catastrophically failing. In his report on the incident, Captain Hall stated that, "It is very unlikely, and there is no evidence, that the explosions or fire contributed to the vessel breaking in half" (Hall 1999). For the reasons discussed above, the author does not reach this same conclusion. It is the author's position that incident responders contemplating the use of in-situ burning as a spill prevention or response strategy must be fully cognizant of the predictable structural ramifications of such action. In particular, the effect that these ramifications will have on subsequent salvage and response efforts should be of highest concern. As previously stated, it is unlikely that the NEW CARISSA structural failure will herald changes to future structural designs or standards. However, a review of the case provides insight to engineers and incident responders on the expected structural behavior of such severely stranded vessels, and highlights possible implications of the in-situ oil burning technique. Note: The views and opinions contained within this case study are those of the contributor, and do not represent the views or positions of the U.S. Coast Guard. Lieutenant Todd Schauer graduated from the U.S. Coast Guard Academy in 1991 with a B.S. in Naval Architecture and Marine Engineering. He served two years aboard the Coast Guard icebreaker POLAR STAR as an Engineering Officer and Damage Control Assistant. He graduated from the University of Michigan in 1995 with M.S.E degrees in Naval Architecture and Marine Engineering and Mechanical Engineering. He is currently working as the Chief of theDomestic Tank Vessel Branch and Assistant Leader of the Salvage Engineering Response Team (SERT) at the USCG Marine Safety Center.